Medical Plaza Pharmacy is a family owned state-of-the-art full service pharmacy specializing in customized and contemporary compounding. We are committed to bringing you the very best professional and quality services, staffed by friendly, helpful and knowledgeable staff. 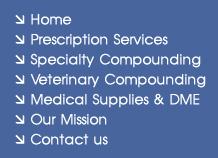 Our Mission is to provide the highest in quality pharmaceutical care, and individualized compounded medications. Customer service is unmatched in the industry. We care about the individual needs of customers and strive to be the market leader among compounding pharmacies for quality, customer service and cutting edge knowledge and technology. If we ever fail to meet any expectations which you may have, your comments and criticisms are always taken into consideration seriously!